Hops were added to crushed and heated barley for flavor. Astonishing progress in the making of beer was displayed by the Ossestian and Chewsure tribes, isolated in the valleys of the Caucasus mountains, when they were first visited by Europeans in the eighteenth century. 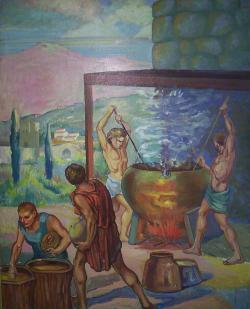 Tribesmen heated crushed barley in large copper cauldrons and relied on natural enzyme action; wild hops were used for flavoring.